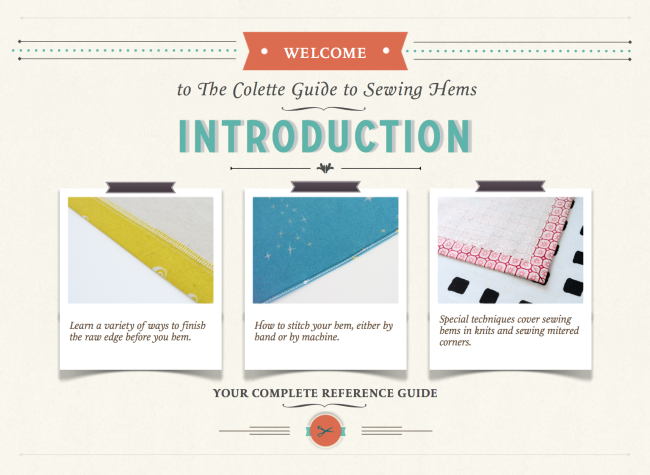 Sign up for your free copy of The Colette Guide to Sewing Hems! Well folks, Sept-HEM-ber has officially drawn to a close. I’d like to thanks Devon for her wonderful contributions all month long. Aren’t her tutorials great? We hope to have her back again very soon. 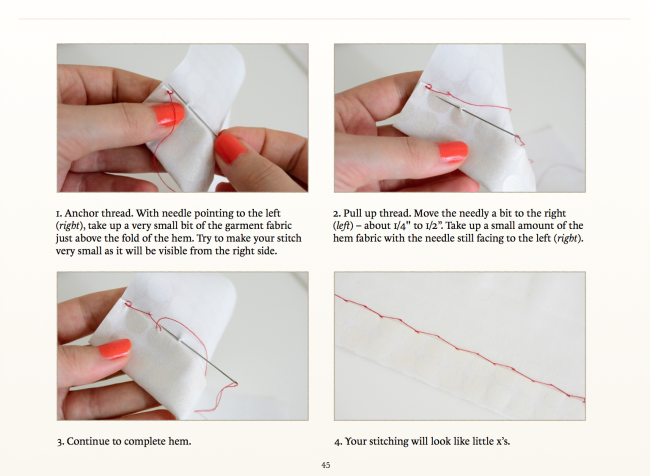 I thought I’d share a few pages of The Colette Guide to Sewing Hems, the book I put together from all our great tutorials this past month, plus many other tips and tricks from Snippets, past blog posts, and more. I’ve been working on this book all month long, and it’s turned out to be over 100 pages of clear, in-depth instructions on all things hem-related. 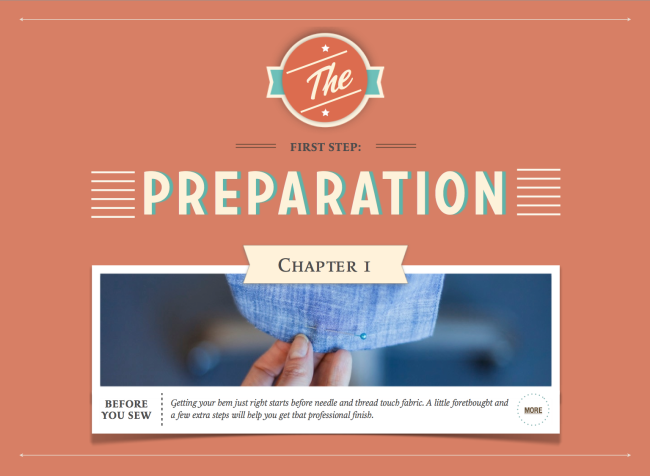 The book is divided into four main sections, covering all aspects of the process: preparing, finishing the raw edge, hem stitches, and special techniques like hemming knits and sewing mitered corners. I’ve even included a handy dandy chart to help you pick out the right hem for your garment. To get the book, click the button below and enter your email. I’ll be mailing out the books to download this evening. And if you read this after I’ve sent them, never fear! Just enter your email and I’ll send you a copy. It’s Sept-hem-ber! All month, we’re talking hems. Thank you so much for putting this together. I was watching all month, but I think I may have missed a couple. This is very helpful!! Looking forward to having this amazing resource at my beck and call – sewing is NOT something I do everyday so when it does show up I need lots of help!!! What a great project! Thank you for making it available to us all. A great resource! Thanks for all your hard work putting it together. Amazing Project! Thank you so much for your hard work. This will be very usefull for me. 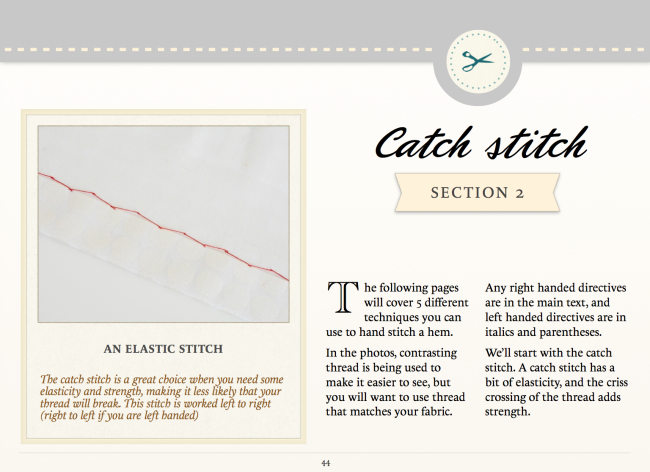 A beautiful and clear set of guidelines and explanations–takes the drag out of finessing those hemming projects! Thank you! Yes, thank you to Devon and the entire team for this month’s series. I loved it! No joke, I’d be riding in the elevator, on my way up to work, and check out the newest Snippet email. What a fantastic resource and for free, amazing. Thanks so much. Thank you for all of your hard work– I can’t believe you’re giving this away for free! Thanks so much for all the work you do! Looking forward to more of these hints and tips. A great resource and thank you. I am so excited that you are giving this away. After so many years of sharing a room for my sewing , it is getting its own room and I finally get to perfect all my stuff with out little hands on it! I need this haha! Lots of ways to improve on those of us who already have a few skills too! This has actually made me realise how poor my hemming repotoire is!! Now for the practicing….errr did I mention how much I love it! Would love to perfect my hems. What a fantastic resource. It would only be better if you came around and did it for me! Thank you so much for all the work, time, expense and vision putting this together!! This is a great resource, all in one place. Thank you! I’m very appreciative of the time and effort put forth in this project! I thank you all very much! This is such an awesome resource. Thank you Sarai and to the entire Colette Pattern team! You guys did such an amazing fantastic job putting this ebook together. Fantastic tutorials, thank you for putting it all together! Oh how nice, thank you for doing this. Downloaded! Devon and Sarai, you rock! Just downloaded – it looks amazing! You are so generous to provide this fantastic resource free. You are a constant source of inspiration. Thank you so much. Thank you! You did a really good job, I´m really looking forward to read all the good stuff you put in this book. I´m really oldfashioned and wanted to print it. Is there any special reason to why the pages72-75 comes out blank when you print? I don’t know why that would be! Perhaps try printing from a different application or a different computer. I don’t see why it wouldn’t print those pages! Thank you so much for this fantastic, comprehensive, beautifully presented guide! It’s very generous of you and is greatly appreciated! Sign me up! 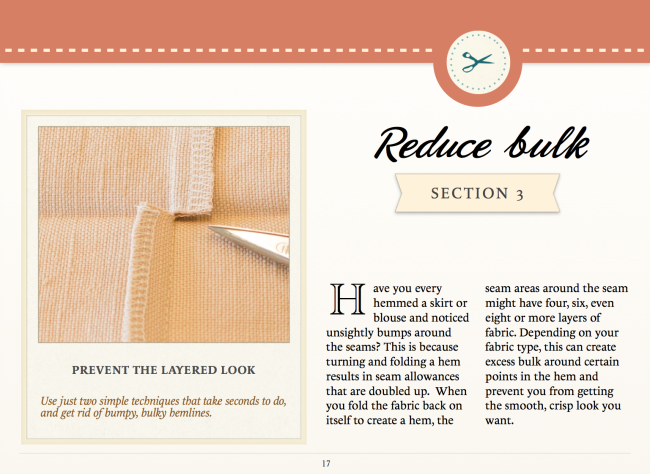 always looking for information to improve my sewing skills! You guys are very generous. I learn a lot and my sewing skill has improved too. Thank you! 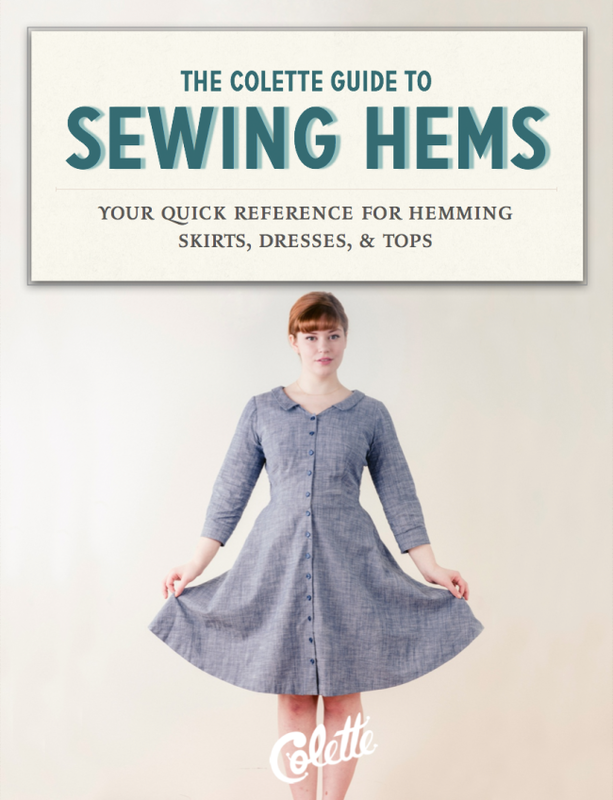 Thank you so much for your generosity in collating the info on sewing hems and sharing it with us. It is much appreciated! Sometimes I even forget how to the ad the needle, I need that much help, I can’t wait to use this. Ok, I usually don’t comment much on blogs, but I just had to say thank you for the awesome guide to hems. I purchased your Sewing Handbook some weeks back, but because of illness in the family haven’t had time to savor its contents. Now, I just purchased 4 more of your patterns with that generous coupon!! So I got enough projects to take me through 2015! Thanks for all your hard work. My love of sewing is officially awakened after being dormant for more than 10 years!! You guys got it going on!! Hi, thanks so much for this, really good to see all the hints together in one place! I have quick question on stabalisers if you have a second, it is more about putting interfacing in the shoulders but the same logic applies to using it on hems. I know you can get knit interfacing and generally this would be the best interfacing to use on knits, well since they both stretch it makes sense. My query is when you want to stop a shoulder or hem from stretching would it be better to use woven interfacing instead or is it still best to use knits – or are both a good idea? I was wondering whether I should use woven on the bias so it has a bit of stretch but not much? Any and all advice very welcome, and thanks again for such a handy resource! Woven cut on the bias can definitely work. You want to be careful using an interfacing with zero stretch, because it can tear if the seam is stretched just a little. Just like using a straight stitch with knits, it *can* work, but there’s a little more risk. I signed up for this but it never came through to my email. It seems to have already been released. Would you be able to email me a copy? Thanks!